Do you recognize the man in the dark jacket? He passed a counterfeit $20 at Jackson’s store in south Boise last month and we’d like to talk to him. The man walked into the Jackson’s at the corner of Cole and Amity roads on March 26 just before 6 p.m. and used the fake $20 to make a purchase. The clerk realized the bill was counterfeit a short time later. By that time, the man was gone. The man, who is about 18-to-20 years old, is between 5 feet 6 inches and 5 feet 9 inches tall, with a medium build. He was wearing a dark jacket and baseball cap. He was driving what appears to be a Saturn four-door sedan. The serial number on the fake $20 is identical to another counterfeit bill passed in Meridian earlier this spring. 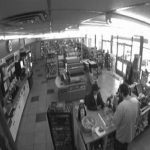 The surveillance photos are blurry but we are hoping someone recognizes the man. Anyone with information should call detectives at 577-3738.